The Fredericksburg Christmas Parade is a favorite community tradition in downtown Fredericksburg, VA. Its mission is to provide a traditional community celebration with a focus on safety and accessibility. 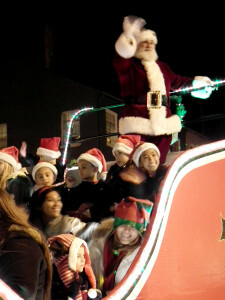 Thousands of people attend the parade each year and the marketing reaches tens of thousands in the months before the event. Sponsor this year’s parade and expand your business brand awareness here in our community. The Fredericksburg Parks, Recreation & Events Department is issuing a call for Christmas Parade Sponsorship proposals, which are being accepted April 22, 2019 through May 20, 2019. The deadline to submit sponsorship proposals for committee review is Monday, May 20, 2019. Please submit proposals to Kim Herbert, Fredericksburg Parks, Recreation & Events, 408 Canal Street, Fredericksburg, VA 22401 or by email at ksherbert@fredericksburgva.gov. Listed here are suggested sponsorship levels, which serve as minimum requirements for a sponsorship of this year’s Fredericksburg Christmas Parade. Offerors are invited to be creative in their proposal and are welcome to include additional items as part of their sponsorship contribution. The City will not accept sponsors that advertise the following: Political campaigns, Special Interest Groups, Personal Causes, Alcohol or Tobacco products of any kind or Lottery advertisements. Sponsors/Advertisers provide commercial goods and services that may be lawfully purchased within the Commonwealth. Offerors will be notified of their Sponsorship Proposal no later than May 31, 2019. Accepted sponsors will enter into an agreement with the City of Fredericksburg for 2019 with option to renew.